Solving a pigeon or pest bird problem is no job for amateurs. When you work with Allison Pest Control, we make finding the right solution to your pigeon problem easy. Pigeons Away, a division of Allison Pest Control, has the knowledge and experience to create an effective pigeon exclusion program no matter what size the project. Our Pigeons Away division, has successfully solved and eliminated pigeon problems for health care facilities, colleges and universities, sports stadiums, federal, state and local government buildings, as well as commercial and industrial facilities. Review our clients past and present to get an idea on our expertise and the scope of jobs we have installed. Not only do these products work to exclude pigeons but can be used to control and exclude sea gulls, swallow, starlings, and other nuisance birds that are damaging your roof, signs, warehouse, and courtyard. Diseases that pest birds may carry. Damage that pigeons and other pest birds cause to roof materials. Which birds are considered pest birds and how to identify them. Our Pigeons Away System does not involve the use of poisons. We do not kill or harm the birds. Our Pigeons Away service team installs pigeon deterrent systems designed to eliminate roosting or nesting on areas of your building where their activity is not welcome. In many cases the installation may include a combination of products from barriers, netting or spring wire systems. Depending on your needs, we have a variety of tested pigeon, sea gull, and bird exclusion devices that are sure to quickly resolve your bird problem. Here is a partial listing of some of the systems we use which can be mechanical or electrical. Electric Barriers - Electrically charged stainless steel wiring is installed on your building ledges. The low voltage electrical impulse is transmitted to the system and provides just enough "shock" to deter all pigeons from roosting or nesting on the newly protected ledges. Bird Netting Systems - Bird netting effectively blocks pigeon entry to large open areas such as courtyards, alleyways, church bell towers and any building opening where pigeons have previously had access to roost or nest due to the architectural design. Bird netting is a permanent barrier that is almost invisible to the casual observer. Spring Wire System - Our spring wire system is designed for narrow ledges, small pipes, flagpoles and other surfaces that require limited perch modification procedures. 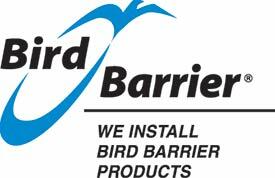 Bird Wire System - Our bird wire system is modifies bird behavior by keeping birds from finding a footing on ledges and narrow spaces. Pigeon Spikes - A spike installation removes any available space for nesting or landing. Pigeon spikes are available in strips and even in configurations for gutter installation. Flexible stainless steel or poly spikes keeps birds off of ledges, parapets, signs, beams, pipes, chimneys, cut-outs, and lights. A Pigeons Away consultant from Allison Pest Control will be happy to visit your facility or building and recommend the appropriate system for your particular problem. Call toll free in New Jersey 1-800-682-6565 or phone (732) 938-4585 outside of New Jersey. To give you an idea of the scope in which we have provided pigeon control services, we have noted a partial list of our clients past and present. Call Pigeons Away part of Allison Pest Control today for help with your pigeon control needs toll free in New Jersey, 1-800-682-6565 or (732) 938-4585 outside of New Jersey. Let us know about your specific requirements. As we have done for so many others, we will develop a pigeon control plan that is tailored to fit your specific needs. We look forward to serving you. © 2012 Allison Pest Control. All Rights Reserved. Proudly serving homes and businesses in Monmouth County and Ocean County, New Jersey since 1917. Visit us on the Web at www.AllisonPest.com. © Allison Pest Control. All Rights Reserved. Proudly serving homes and businesses in Monmouth and Ocean County, New Jersey since 1917. Providing neighborhood pest control services in Brick, Colts Neck, Farmingdale, Holmdel, Neptune, Red Bank, Rumson, Sea Girt, Spring Lake, Tom's River, Wall, and all points in between. Visit our new mobile-friendly website at AllisonPestControl.com.